When people think of measurable greatness on the NBA hardwood, names like Michael Jordan, Kobe Bryant, Magic Johnson and LeBron James are almost always the first ones brought up. When people narrow that criteria down to “great big men”, Bill Russell, Wilt Chamberlain, Kareem Abdul-Jabbar and Shaquille O’Neal are the first to be crossed off. And while all of these players were and are great, did any of them win the NBA MVP on a sub-50 win team? How many of them are the all-time leader in offensive rebounds? Are they all on the elite list of eight players who won the league MVP three or more times? Only one man has the distinction of having each of these be part of his bio and, on September 13th, the world tragically lost the 6-10, 260 lb. giant affectionately known as “The Chairman of the Boards”. His name? 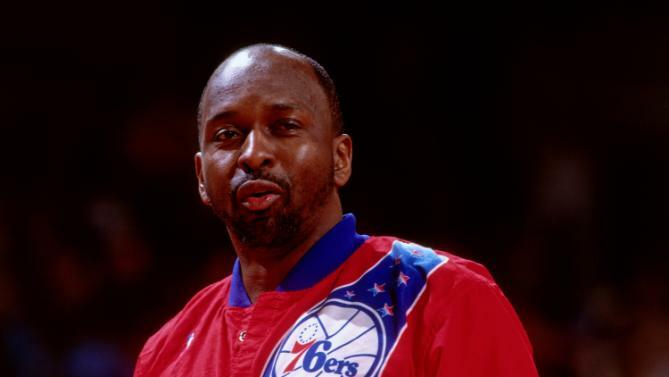 Moses Malone. Malone was found deceased in his hotel room at the Marriot in Downtown Norfolk after suffering from what has since been determined as “cardiovascular disease”. He was scheduled to appear at the Still Hope Foundation Celebrity Golf Tournament and had been in good spirits prior to Sunday. Malone’s passing adds to the list of great African-American NBA players who have died in 2015. First, it was pioneer Earl Lloyd, who passed away February 26th at age 86. Often thought of as the NBA’s Jackie Robinson, Lloyd was the first black player to play in an NBA game in 1950. Then, it was Knicks legend and NBA Defensive Player of the Year Award winner Anthony Mason, who passed away at 48 just two days later. Almost seven months later, Darryl “Chocolate Thunder” Dawkins passed away at 58 on August 27th. Dawkins is best known for his being the reason why breakaway rims exist after shattering two backboards in 1979. Born in Petersburg, VA, Malone is known as the greatest basketball player the Richmond area has ever produced. Just how great was he? Let’s just say this: had it not been for Malone being the first “prep-to-pros” player in 1974, it’s likely that Bryant, James and fellow great big man Kevin Garnett wouldn’t have. Malone is still the school’s all-time leading scorer, an achievement he accomplished in fewer than three varsity seasons, scoring 2,124 points. “He put Petersburg on the map in terms of athletics,” Petersburg athletics director Bill Lawson III said on Sunday. “Our hearts are heavy in Petersburg as we’ve lost someone who made strides for our city. Our condolences go out to the family.” Petersburg won state championships in 1973 and 1974 in Malone’s junior and senior years, including two 25-0 seasons. Earlier this year, Petersburg created a school hall of fame, and Malone was among the first inductees. Malone signed a letter of intent to play for the University of Maryland but, due to his desire to take care of his family, he opted to forgo college and began his pro career in the now-defunct American Basketball Association. He played for the Utah Stars and St. Louis Spirits, was named an All-Star his rookie year, and averaged 17 points and 13 rebounds. When the league merged with the NBA in 1976, he was taken fifth in a dispersal draft for ABA players and was traded to the Buffalo Braves, now known as the L.A. Clippers. He would play for eight NBA teams, including the Washington Bullets (Wizards) and go on to become a 12-time All-Star, a six-time rebounding leader and a NBA Champion in 1983 with the Philadelphia 76ers. There will never be another player like Malone and past and present players, as well as media and other figures, continue to share their sadness on the passing of the NBA legend. Most modern-day fans may not know of Malone’s ferocious rebounding ability and soft touch around the rim outside of NBA 2K15 but the man was ahead of his time. The void left by Malone’s passing will never be filled, just like his chairman’s seat at the table of great NBA big men. Previous Previous post: Tom Brady beats allegations and wins season opener, Are the Pats moving on?